6 weeks ago, I signed up for the Better Homes and Gardens One Room Challenge. It’s not a competition, just some motivation to start and finish a room within 6 weeks, with a bunch of other people doing the same! I didn’t do anything too dramatic or expensive, mostly using things I already had, along with a some thrifted finds. Changing out a light, painting the walls, some DIY projects including some prints, vertical shiplap and an easy sign and the difference is night and day. I’m so happy with the change and even happier that it didn’t cost much! I was supposed to post updates weekly, but I’m going to need to learn to love progress photos, because here we are at week 6 with my first and last post. I love to have my kids share a room. I have 2 girls and 2 boys and for now, we have a girl room and a boy room. Maybe they will grow out of it someday, but I grew up sharing a room with my sister who is still one of my best friends. Maybe those late night shenanigans had something to do with our friendship? I’m willing to bet on it. There are a million reasons why I like my kids to share rooms, but I won’t go into that. My goal was to make them a comfortable and cool space where they like to hang out. We’ve done bunk beds in the past and while they make a lot of sense, I have loved having individual beds. Sometimes, you just have to get in there for a snuggle and those top-bunkers always miss out on that. Never to old for a bedtime snuggle. We started out by painting the walls Sherwin Williams Dover White, which is a warm white (we had to go warm because of our existing trim color). We rearranged the furniture over and over again until we finally settled on this arrangement. I normally wouldn’t put beds in front of a window, but this gave the most usable floor space and symmetry. I’m into symmetry. Then we switched out that old light for a modern update. We tried a couple of different options, but ended up being really happy with this option from Amazon. Such an improvement without a lot of cost. We also decided we wanted an accent wall. We went with some vertical “shiplap” with 1/4 inch gaps for a clean and modern look. We used 1/4 inch underpayment material from Home Depot and had them cut it into 1/4 inch strips. 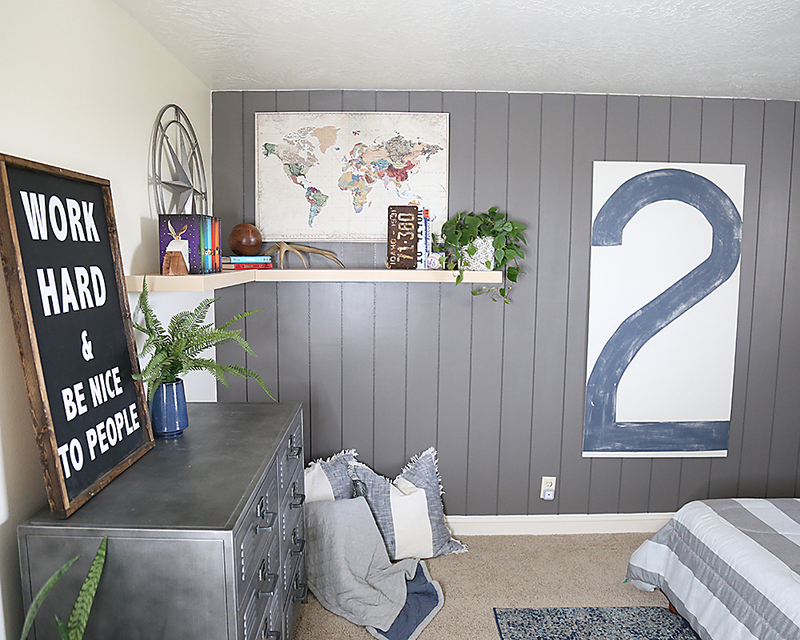 We painted the accent wall Behr Marquee Unpredictable Hue. In the process, we removed and replaced the trim, which proved to be the tricky part. With some trial and error and a bit of caulk, we are happy with the outcome. I love white and crisp, but I am a big fan of a fun or funky accent too! This “Work Hard” sign came from a local shop, Artisign Designs. I love everything she does, you cant go wrong! Some Ikea Lack shelves filled with thrifted treasures, favorite books and souvenirs is my favorite part. Below are the sources for everything pictured.